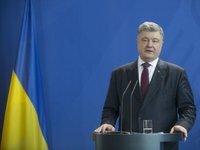 The National Reforms Council will review the bill that is increasing penalties for violations of electoral law, Ukraine's President Petro Poroshenko has announced. "We are going to submit the bill that is meant to significantly increase the penalties for violations of the electoral legislation while elections are in progress to the National Reforms Council. And we will do our best not to allow for either vote buying or the Russian interference, which is especially dangerous," Poroshenko said in an interview with ZIK TV channel. He recalled that the Russian interference with the U.S. Elections had been proved and announced that he had called on partner nations to share their experiences preventing the Russian meddling in the electoral process. "I would like to stress that I have contacted both our partners in the EU, in particular, Germany and France, and our partners in the United States with relevant proposals, and I asked them to share their experiences, including those in the legislative domain, on preventing Russia's interference with electoral processes. I will not keep it secret from you that they have already sent their experts here to work together with our specialists in cybersecurity and protection against intrusions from the outside. And this work will go on," Poroshenko said.